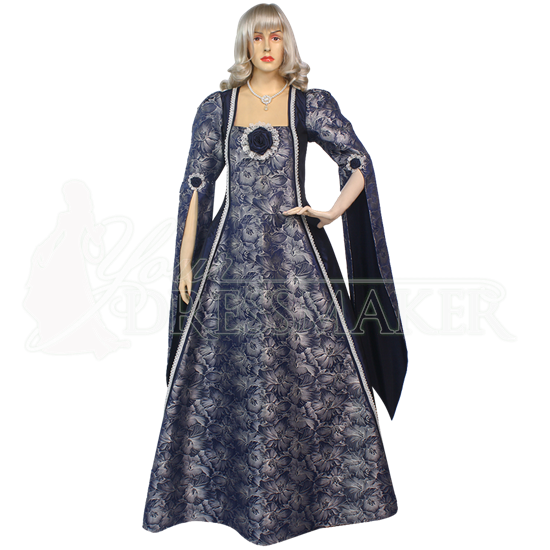 Beautiful brocade patterned with blue and white flowers is matched with dark blue taffeta to create the Royal Blue Renaissance Dress. This handmade gown is embellished with delicate white lace trim where these two fabrics meet. The fitted bodice features inner boning and a lace-up back to help you achieve your ideal historic silhouette. At the center of the square neckline is an artfully crafted taffeta and lace rose, matched by a rose on each of its open hanging sleeves, which fall nearly to the hem of the dress, helping you achieve a regal appearance when you wear this historic gown to your next reenactment event, Renaissance festival, or costume ball. Wear a petticoat underneath this dress, sold separately, to showcase the fullness of the skirt. Jewelry shown is not included.